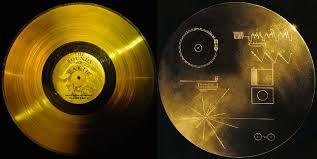 NASA’s Voyager mission turns 40 years old: What is it and what’s on the golden record? Here's a look back at what it's done! 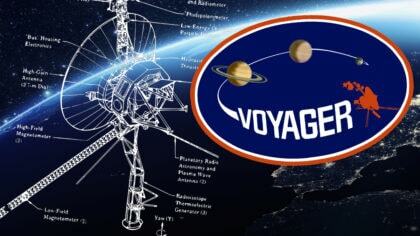 NASA’s Voyager mission celebrates 40 years in space this year! The Voyager mission consists of two identical spacecraft, Voyager 1 and Voyager 2. They were launched in 1977 and the information they’ve discovered so far is amazing! Voyager delivered the first close-up views of Uranus and Neptune, revealed “spokes” in the rings of Saturn, and uncovered details of Jupiter’s storm that had never been seen before! It also found volcanic plumes on far-flung planets and the potential for life on the moons near Saturn. In 2012, Voyager 1 left our solar system and entered ‘interstellar space’, far beyond our solar system. It also took a really iconic photograph known as ‘Pale Blue Dot’ – that’s us, Earth, circled – from a very long way away! Voyager 1 is now the most distant man-made object from Earth and it carries something very special; a gold-plated record filled with sounds and pictures from our Earth. It’s a kind of time-capsule intended for whoever happens to find it. There’s even a recording from U.S. President Jimmy Carter on it! Like space? Find out more about it with our podcast series, Deep Space High! In Intergalactic Weather Watch, we find out all about the Solar Dynamics Observatory, S.T.E.R.E.O. and cluster missions – all types of spacecraft!